Today is the first official day of fall so I thought it would be a great time to introduce my new Halloween Party Printable Collection! I absolutely love Halloween. I think it has something to do with seeing my kids dressed up in cute costumes and having lots of sweet treats nearby. These paper sacks purchased from Michaels are perfectly sized to to hand out goodies like a pouch of fruit snacks, stickers, and tattoos to friends and the personalized tags add a nice touch! The mini Hershey candies are always a big hit when I serve them at a party. 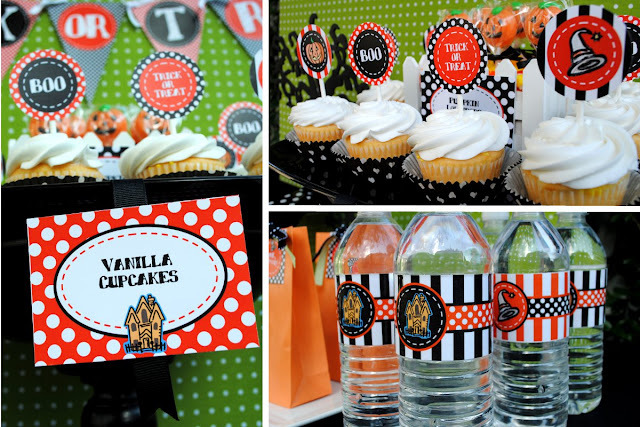 They can easily be transformed to match the party theme using the coordinating labels and some double-sided tape! These bright bag labels are not only great to hand out at your Halloween party, but they would be nice to put into your child's lunchbox since they are sized to fit a standard sandwich or snack bag. I bought the spooky trees from Dollar Tree and I wrapped tissue boxes in black and white polka dot paper to add height. You can create this Halloween Rosette Paper Banner using my tutorial HERE. The floor-length tablecloth is actually a very affordable black queen-sized bedsheet purchased from Walmart. I had so much fun designing this table! Thanks to my wonderful husband for being my partner and helping me once again on another project! 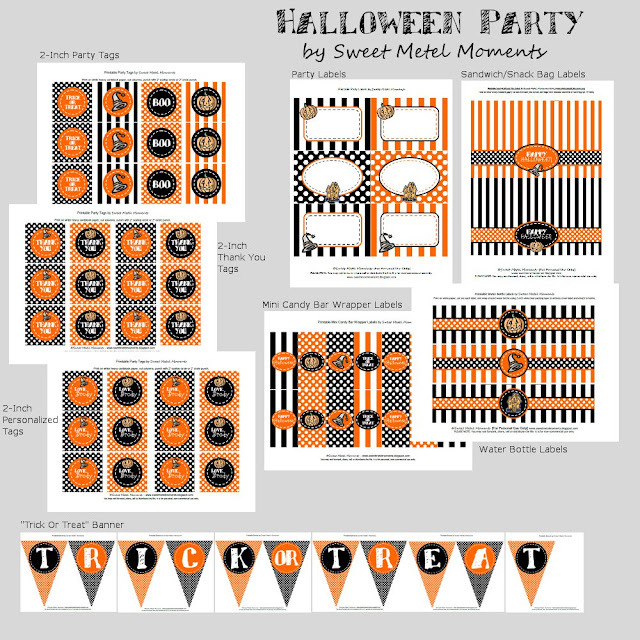 Check out the Halloween Party printable collection in my Etsy Shop! The full collection is on sale through the month of September for only $9.00! adorable! i think i saw a similar tree at Target's dollar bin! great job! Adorable!! So glad Riccinni shared this with us!! Iris you are so talented!! Thanks Lili and Stacey for your sweet comments, this was so much fun to create! Looks great! What did you use for the cupcake stand in the middle? The cupcake stand in the middle is actually a decorative wooden pedestal bowl I found on clearance at Ross! I used a black tray (recycled from a Walmart deli platter) to put the actual cupcakes on and put that on top of the pedestal bowl. I love Halloween too! How did you get your green dotted backdrop to stay standing? The backdrop is actually leaning on a fence. :-) Hope you have a fun and safe Halloween! Thanks for visiting my blog!